But it has been my impression that the main story, Monckton’s press releases notwithstanding, has been (and still is) the FPS Editor remarking that there is a considerable number of scientists skeptical of the IPCC conclusions. The FPS Executive Committee now states on the FPS July 2008 page that they do not agree with the previous remark, suggesting it is all a matter of opinion. However, with the APS jumping in against Monckton’s paper with red inks (thankfully now turned to black), and more than one call for the FPS Editor to be “fired” from his volunteer position for the mere reason that he made that remark, I wonder what kind of “debate” could at all be possible? Actually, I’d rather the APS had replied with Gavin’s words “The obvious ineptitude of this contribution etc etc” challenging any of its readers to come up with something better than Monckton’s. More figures to understand how awfully incomplete is the current knowledge of global climate. And it’s very clear for all to see in the IPCC Fourth Assessment Report – Working Group 2 (AR4-WG2), in Chapter 1 and in the Summary for Policymakers. A bumper 96% of reported changes are from Europe and Europe alone. And what does that mean? It means that for the whole of Australia/New Zealand, the IPCC could find only 6 significant changes (SC). For the whole of Africa, 7 SCs. For the whole of Latin America, 58 SCs. For the whole of Asia, 114SCs. But one may reply to that, I am putting too much emphasis on the 28,000+ European biological SCs. It is blazingly blatant that before we can speak of global warming, more data has to be collected at least about Africa/Asia/Australia-New Zealand/South America . Is anybody in the IPCC/Al Gore/James Hansen/Tim Flannery crowd pushing hard to get a complete picture of what is changing where and how? …because a “stupid” is somebody that damages others without a gain for himself: whilst the APS has only damaged itself. Mathematical proof that there is no “climate crisis” appears today in a major, peer-reviewed paper in Physics and Society, a learned journal of the 46,000-strong American Physical Society, SPPI reports. Should have been child’s play to issue a counter-release explaining that there cannot be any mathematical proof in a scientific field (outside of mathematics, that is); that “Physics and Society” is a newsletter, and not a “learned journal”; and that Monckton’s invited article was only part of the beginning of a debate. Look what’s happened instead: Monckton is now perfectly in the right to state that he’s been unfairly, and uncourteously treated. He’s been invited to write an article that has been published, that then caused APS to undergo all sorts of fits, including a series of unwarranted put-downs plastered all over the place in apparent panic. Physics and Society is the quarterly of the Forum on Physics and Society, a division of the American Physical Society. It presents letters, commentary, book reviews and reviewed articles on the relations of physics and the physics community to government and society. Now..what is the difference between peer-reviewed and reviewed? Is there such a thing in scientific circles as an article reviewed but not by peers? Has anybody ever heard of an inferior-reviewed article? Or of a superior-reviewed article? Who knows? Looks like at the APS they have been cavalier with the issue of reviewing, until now. But if they need to sort out their own house, it should be for the future, and not for the past (unless they want to go against the principle of cause and effect). And so Monckton on one thing is certainly right: for all intents and purposes, maybe the wrong way, maybe without thinking at the consequence, but Monckton’s article has been peer-reviewed indeed. Discussions with people holding a different view are obviously quite likely to help bring one’s reasoning forward (as long as there is no name-calling or other infantilism). For an example of what can happen, look no further than this exchange with Ed Darrell at his Millard Fillmore’s Bathtub. The topic is, what is the relevance of the fact that the NASA Planetary Atmospheres website (PDS-A) doesn’t mention greenhouse gases. if the experts in the field don’t take it into consideration, I surely want to know why!! The site doesn’t pretend to be an exhaustive resource for all studies of all atmospheres everywhere. It’s a site to get a line into work NASA has actually done. But if that’s true, it means that in all these years, NASA has seldom if ever looked at ways to investigate the same greenhouse effect that keeps Earth’s average temperature above freezing, and Venus with a surface temperature higher than an oven. And furthermore, there is a dearth of data in this most practical of planetary atmospheric fields!! Let’s try to figure out if Ed’s interpretation is right. In its About page, the PDS-A site says “As an additional service, the Atmospheres Node provides information on relevant planetary atmospheres topics for educational purposes”. The objective of this activity is to involve undergraduate students in research and development projects related to the holdings of NASA.s Planetary Data System (PDS). Through the PDS College Student Investigators activity, the PDS strives to prepare the next generation of PDS science investigators. A recent proposal is about investigating the role of dust in the thermodynamics of the Martian atmosphere. Neither there nor elsewhere there is any mention of greenhouse gases, a topic that evidently and mysteriously does not interest “next generation of PDS science investigators”. Going back to PDS-A, there are educational links also to “Broker Forums“. One of them is the web site for the “Sun-Earth Connection” at NASA’s Goddard Spaceflight Center, curiously linking to another website “Space Weather” containing a few unorthodox remarks on the Sun and Earth’s climate. Another link for the Broker Forums goes to NASA’s Solary System Educational website where (finally!) there is some serious content about the greenhouse effect (GH). what is the role of the radiative balance and greenhouse effect in the past present and future evolution of the planet? Chapeau to Ed Darrel, then…for all intents and purposes, NASA has dedicated no mission to the study of the greenhouse effect. That’s why there is no mention of it in the PDS-A site, the Planetary Data System for Atmosphere: simply, there is no data to report. Because nobody ever looked for those. Is the current state of Climatology on this planet and everywhere else sad or what? If Goddard’s Director and climate worrier James Hansen is unable to gather funds for a terrestrial or planetary mission on the greenhouse effect; or worse, if even he is not interested enough to put one together: then how solid will the science of the climate ever be? The above from the Solar Storms “Space Weather” website, listing NASA more than once in its endorsements page. Scientists have examined the climate record for other signs of the connection between space weather and climate-weather changes with many surprising results listed below. Hi – you are using the wrong picture to accompany one article about the Ofcom ruling on the “Global Warming Swindle” documentary. 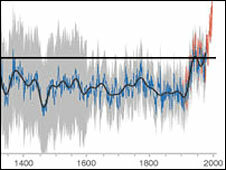 The above can be seen in a 2004 BBC News article “Climate legacy of ‘hockey stick’“. 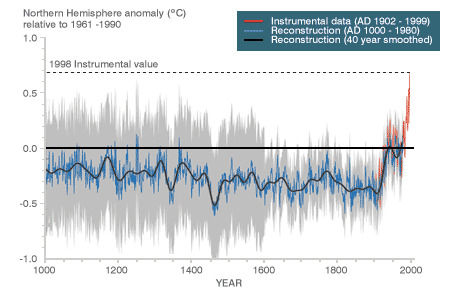 That graph is published in the BBC News website’s “Climate Change: The evidence“. Please have it fixed asap. After all, the article with the wrong picture is about…accuracy in the media!! LATEST: A Channel 4 film on global warming broke Ofcom rules on impartiality and fairness, the regulator says. The link goes to an article by Richard Black, titled “Climate documentary ‘broke rules’” summarised as “A controversial Channel 4 film on global warming broke Ofcom rules, the media regulator says.” Still, it “did not mislead audiences”. Enough for now, apart from a link to the 86-page bulletin, 17 of which dedicated to Channel 4 and the Swindle documentary. […] Ofcom received 265 complaints about the programme from members of the public. Ofcom also received a substantial complaint 176 pages long from a group of complainants, some of whom were scientists (“the Group Complaint”). and, not giving an accurate and fair presentation of the expertise and credibility of various contributors. […] Ofcom considers it of paramount importance that broadcasters, such as Channel 4, continue to explore controversial subject matter. While such programmes can polarise opinion, they are essential to our understanding of the world around us and are amongst the most important content that broadcasters produce. It is inevitable such programmes will have a high profile and may lead to a large number of complaints. […] In dealing with an issue such as the theory of anthropogenic global warming, which is the subject of scientific controversy, those involved in the debate will – by definition – disagree over the factual accuracy of each others’ claims. Therefore, it is to some extent inevitable that in a polemical programme such as The Great Global Warming both sides of the argument will violently disagree about the ‘facts’. […] (regarding the reliability of climate models) Ofcom noted that, although the complainants disagreed with the points made by the contributors in the programme, they did not suggest that the overall statements about climate models were factually inaccurate […] Overall however Ofcom’s view was that the passages complained of were not materially misleading so as to cause harm and offence. […] (regarding the contributors to the programme) The decisions by the programme makers not to include all the qualifications of contributors, and not to include more background on them (some of which is strongly disputed), were editorial decisions which overall did not in Ofcom’s view result in the audience being materially misled. […] while unfairness to participants has been found (failures to give an adequate opportunity to respond and the unfair presentation of views), Ofcom does not consider that, overall, these failures led to material being transmitted which was so misleading that harm would have been caused to viewers. […] Ofcom also had regard to the fact that, both domestically and on a worldwide level, the political debate had largely moved on from questioning the causes of climate change to attempting to find solutions to deal with it. Therefore, in the political arena at least, there was a very broad consensus of opinion which accepted the scientific theory of man-made global warming. In this respect it could be said that the discussion about the causes of global warming was to a very great extent settled by the date of broadcast (8 March 2007). […] (in part five) These issues are matters of major political controversy and are major matters relating to current public policy as defined by the Code. During this section no alternative views on this issue were presented […] Part Five of the programme therefore breached Rules 5.11 and 5.12. […] (regarding the IPCC) The Committee found that the programme broadcast a number of comments by contributors that amounted to serious allegations about the IPCC […] The Committee found that the IPCC had not been provided with a proper opportunity to respond to these allegations. Therefore, the broadcast of the allegations had been unfair. […] Channel 4 maintained that the IPCC had been offered an appropriate opportunity to respond. Channel 4 said the right to reply letter had been sent to the IPCC press officer nine days before the programme was broadcast, excluding the weekend which fell in between. Channel 4 said nine days was an appropriate and acceptable time period in which right of reply requests are sent and responses are expected to be received. Channel 4 said that no response was received whatsoever, not even to request more time for the IPCC’s response. […] the Committee considered that it was unreasonable for the programme makers to have expected the IPCC to understand that its response was required in a matter of days, and that it was not reasonable to expect the IPCC to be able to provide a response within the one day of being advised of the deadline. The Committee therefore found that the opportunity to respond had not been offered in a timely way. IPCC to understand the nature of Professor Reiter’s criticisms in relation to malaria […] the Committee concluded that the IPCC was not afforded a timely opportunity to respond to the allegation that the statements by the IPCC in relation to the spread of malaria were alarmist, untrue and based on poor scientific literature. […] In the Committee’s view Professor Wunsch made clear in his full unedited interview that he largely accepted this consensus and the seriousness of the threat of global warming (albeit with caveats about proof) and therefore found that the presentation of Professor Wunsch’s views, within the wider context of the programme, resulted in unfairness to him.